San Diego, CA, USA – Early morning mist still hung over San Diego as His Holiness the Dalai Lama drove to the RIMAC Field, where he was received once again by University of California San Diego (UCSD) Chancellor Pradeep Khosla. Members of UCSD faculty and leadership were lined up to be introduced to him. Like them he donned the University gown and cap. There were cheers from the audience as he walked onto the stage. The commencement ceremony began with everyone standing for an acappella rendition of the National Anthem. Chancellor Pradeep Khosla began by congratulating the class of 2017 and welcoming graduates, parents and the keynote speaker. 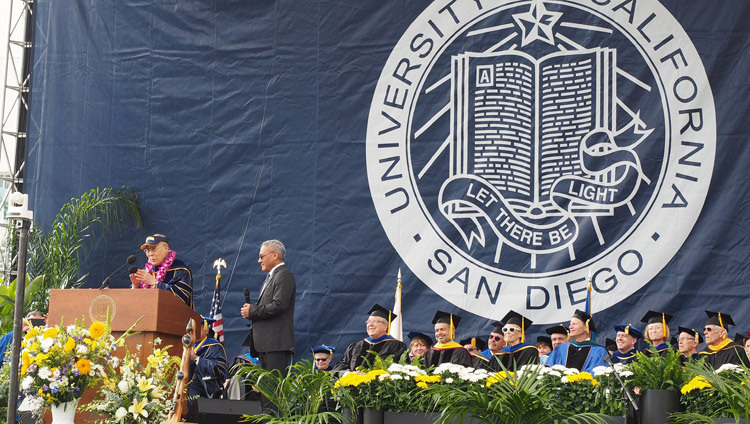 He introduced His Holiness to the gathering, describing where he was born and his achievements adding that he was about to give him the UCSD medal, the University’s highest award. There was also a garland of flowers and a string of beads, but when he presented His Holiness with a UCSD Triton baseball visor and he put it on a loud cheer went up. His Holiness began his address in his customary way: “Respected elder brothers and sisters and mainly younger brothers and sisters, I’m extremely happy to participate in this—I don’t know the word—commencement. I first started to learn English in the 1940s, but it’s still pretty broken. As a Buddhist monk I felt that English wasn’t strictly necessary to reach Buddhahood and since my childhood I’ve tended to be a lazy student. “Meeting with young people like you I’m aware you are the future of humanity. And here and now at the beginning of the 21st century you have the opportunity and responsibility to create a better world, a happier world—a world without violence or the yawning gap between rich and poor. We older ones may not live to see it, but you will. “Human beings are social animals and heavily interdependent. Climate change threatens us all. It’s one of those natural challenges that teach us that we must work together, making a common effort to reach a common goal. A more peaceful world and a more peaceful century require that we rely not on weapons but on developing a widespread inner peace. His Holiness expressed appreciation to the teachers whose efforts had contributed to today’s graduates’ success. Noting the presence of Indians among the students and teachers, His Holiness recalled that his own training and intellectual development were rooted in ancient Indian knowledge—the Nalanda tradition. He remarked that he has lately realised the importance of trying to revive this ancient knowledge. He also observed that among the students are Chinese—historically followers of the Buddha. He reported that a Chinese university recently estimated that there are more than 300 million Buddhists in China. He recommended they pay more attention to their cultural heritage. His Holiness suggested that more attention to deepening such human values as compassion in India and China would have the effect of reducing corruption and closing the gap between rich and poor. He added that understanding the workings of the mind and emotions and the application of logic were not confined to Buddhist studies. They could be subject to an open academic approach—a project UCSD might consider exploring. His Holiness’s words were received with warm applause. He was followed by a graduating student, Ricky Flahive who shared his experience of wonder at reaching this graduation. He congratulated his fellow Tritons and encouraged them to write the next chapter of their lives heeding His Holiness’s advice of service before self. Executive Vice Chancellor Peter Cowhey requested the various Deans of Arts and Humanities, Biological Sciences, Engineering, Physical Sciences, Social Sciences, Management, Marine Sciences and Health Sciences to call on their graduates to rise and be recognised before requesting the Chancellor to confer their degrees. Ricky Flahive led the turning of tassels, Chancellor Khosla thanked His Holiness once again for attending and the gathering dispersed. His Holiness later attended a lunch with the Leadership of the University of California San Diego. During the course of this he was introduced by his old friend Richard Blum. He thanked His Holiness for the steady inspiration he has provided him over 45 years of friendship and expressed joy that he is committed to live to the age of 113. When it came to his own remarks His Holiness clarified this. “Some highly realised people have the ability to see the future,” he said. “We have a normal sensory consciousness related to our brains, but when we dream our consciousness is subtler. In deep sleep it is subtler still and the subtlest consciousness of all manifests at the time of death. “Over the last 40 years or so, there have been about 30 cases of people who, because they have manifested the subtlest minds, appear to be clinically dead and yet their bodies remain fresh. My own tutor demonstrated this for thirteen days. Modern scientists have no explanation for this, but a project has been started to investigate it. His Holiness said he was encouraged by his efforts to revive ancient Indian knowledge of the mind and was confident that there were others to take it forward. Scientists are interested in exploring the mind and many more people are showing interest in inner values. This, he said, is a sign of hope. Chancellor Khosla closed the meeting with thanks to His Holiness for sharing his wisdom. Before retiring for the day, His Holiness paid a short visit to the Center for the Future of Surgery where he was shown techniques for training surgeons using the latest equipment and procedures. Tomorrow, he has been invited to visit San Diego Zoo.